Cats love these body pillows! And this large size is perfect for big cats or small cats with big attitudes. Long enough to hug, hold with the front feet, and bunny-kick with the back, these pillows are bound to become your cat's favorite toy. The honeysuckle inside will only add to your cat's play experience. Note: Honeysuckle cat toys are made with the wood of the Tartarian honeysuckle bush, not with honeysuckle flowers, which are toxic to cats. Therefore, honeysuckle cat toys don't smell like honeysuckle flowers. You can learn more here: "Honeysuckle: When Catnip Doesn't Create a Crazy Cat"
Price is for one Body Pillow. Please allow us to surprise you with a design. Honeysuckle affects some cats the same way catnip does! They like to inhale, rub on, and lick it, and it can result in extra playfulness and energy. 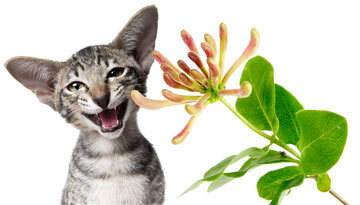 In fact, many cats that don’t respond to catnip are affected by honeysuckle. Our honeysuckle toys are made in the USA and filled with quality honeysuckle. Tip: if your honeysuckle toy seems to lose some of its potency, spritzing it with water will rejuvenate it! My cats were happy with these at first and really enjoyed them. But after initial appreciation have not shown much interest. Could be because they are old, one is 17 and the other 3 are 12. At first I thought I should have bought 4 so each could have one. I might give them to my daughters kittens.